If you are looking for a typical charming French restaurant, this is the place you’ll want to eat at. L’épicerie is famous for its delicious Tartines (huge slice of bread with different toppings),its homemade desserts and its really cute 1950’s atmosphere. You’ll love the red and white checked tablecloths, the antique furniture and the hundreds of retro objects on the walls. 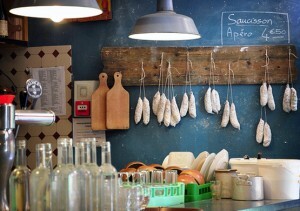 At L’Epicerie you will eat a great homemade meal for less then 15 euros. The speculoos cheesecake and the goat cheese, honey and walnut tartine are to die for! Also, for just 2 euros you can add a side salad! This famous restaurant is an authentic historical place where you will be able to try the local specialties. 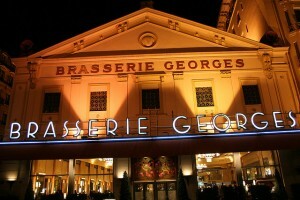 La Brasserie Georges opened in 1836 and is the oldest Brasserie in Lyon. Over the many years, La Brasserie Georges has become a major culinary “hot spot!” The restaurant can host up to 700 guests in one sitting which makes it a noisy place but very entertaining and fun! Their meals are a little over 20 euros, however some of the main dishes are cheaper. If you want to travel back in the 19th century while eating some French specialties, you will have a wonderful time at La Brasserie Georges. Also a note for you beer lovers: La Brasserie Georges brews its own beer ! 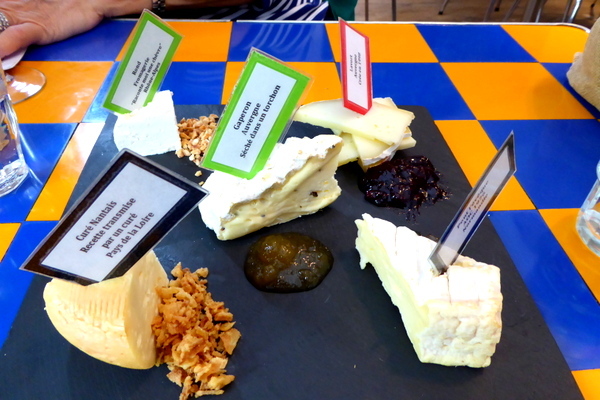 If you want to try some French cheeses, you must go to L’instant fromage! You won’t believe how many varieties of cheeses they will have on offer for you to taste! This little restaurant is located in the charming neighborhood of Ainay (in the 2nd district) which makes it even more attractive to visit. 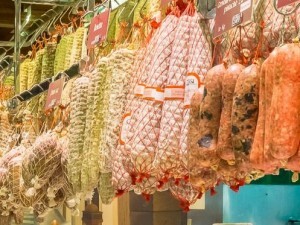 Their salads, tartines and charcuterie plates are also to die for! Overall you will be able to fill up for less than 15 euros per person for a typical French evening with great cheese and wine! 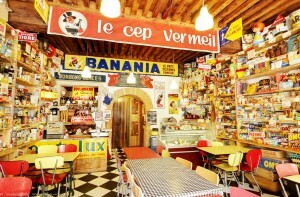 This typical 1960’s restaurant is fully decorated with vintage furniture and objects of all types. In this laid back and casual restaurant, the food is great and one of the cheapest option around! 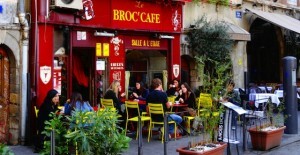 Great place to stop for lunch for a quick salad or tartine. You won’t spend more than 15 euros (drink included) and you will be amazed by the amount of retro/vintage details inside this tiny little French restaurant. 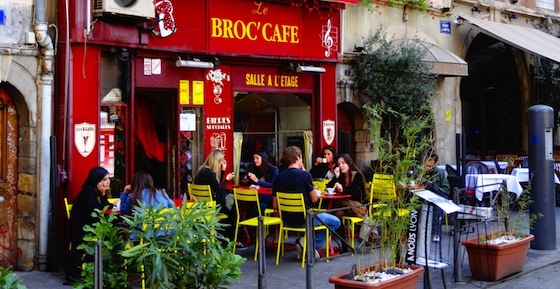 Located in the heart of Lyon (near Bellecour), you will be able to eat at this restaurant for less than 20 euros (including drinks) and enjoy great homemade meals in a typical French café with quiet terrace. 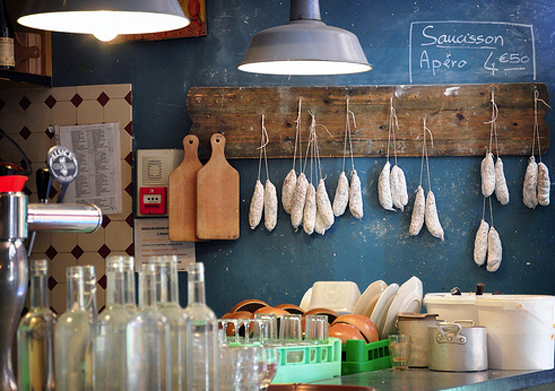 Their ‘plat du jour’ (dish of the day) is usually around 10 euros and can be very filling! 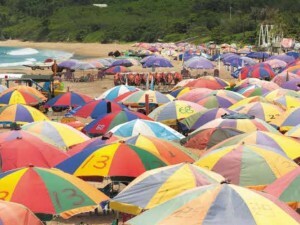 Locals particularly enjoy the warm comfortable atmosphere, the foosball and the friendly staff. 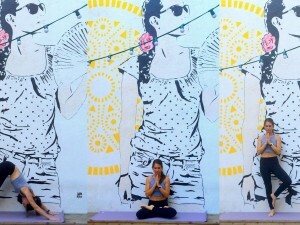 Whether you want to grab coffee at 8 am, eat lunch, have a nice dinner or go out for drinks, this place is always a great choice!